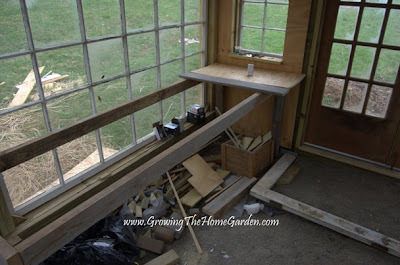 While earlier in the week brought progress to the outside of the greenhouse garden shed this weekend brought some progress to the inside. 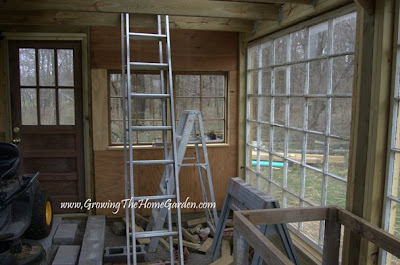 I had already insulated parts of the shed where there is no glass but I needed to cover the insulation. Fortunately there is plenty of scrap plywood laying around the shed from doing the outside sheathing plus some old sheets of plywood I've collected over time. I love being able to use bits and pieces of previous projects in new ways. It makes things cheaper and eliminates waste! I cut the pieces to size and screwed them in using 1 5/8" coated screws. I prefer screws over nails, mainly because if I ever need to get into those areas it will be very simple. Here's a picture of the front from the inside. And here is a picture of the back from the inside. Underneath the windows will be a small set of old cabinets. A little sanding and painting and they'll be perfect for the space. When I get the chance I'll paint the inside white to increase the lighting slightly. Don't look for that post anytime soon! Here is the beginning of a plant bench. I'll be adding a second shelf underneath that will be even with the windows. Below that I can keep pots and flats for seed starting or cuttings. For now that's where the trash is! I'm not sure if you can see it but on top of the bench is a little device. It's a radio thermometer that sends a signal to my house to let me know what the temperatures are like inside. The greenhouse is still very gappy but stays consistently 10 degrees warmer than the outside temperatures. The real test will be next winter! I feel like I'm finally making some good progress. The recent spring warm-up is very welcome in my garden, how about yours? Now where do you get a thermometer like that? 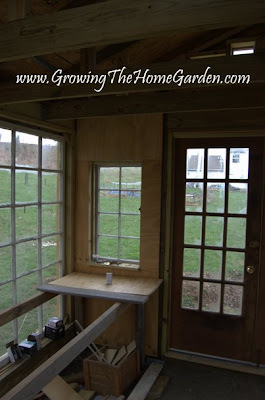 I never even knew they had something like that and can sure use one here for my small greenhouse. Too cool. How are you going to heat it? I bought a ceramic heater that just won't work:( Now I need a backup plan for the winter. Good thing it is spring and wonderful! Your windows will make for great growing conditions for the plants. You can find those thermometers at any of the box stores. They aren't too expensive either. I haven't decided about heating yet for the winter. It all depends on what I want to grow in there. I think I may allow it to cool off in December and January then start warming up in Feb., I'm not sure though. Dave, the glass windows are awesome. The space is really starting to look good.. some painted cabinets and some cuttings sitting on the cabinet top will make it perfect. I love it! i have beens saving old windows for this very project. I have enough to build a castle now! Cabinets have been started actually! Pretty soon I'll be able to do cuttings - I can't wait! I would love to see a greenhouse castle! Looking good Dave. Can't wait to see some cuttings in there. Wow, I love it! What a wonderful place to spend some time! Good to hear that there's progress in your greenhouse garden shed. I hope you update us when it's finished.